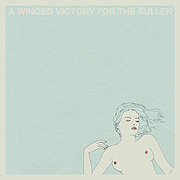 Although the band name seems to emanate irony, the music on the self-titled debut CD by A Winged Victory for the Sullen does not posses even one drop of it. This wonderful collaboration between Adam Wiltzie of the drone based Ambient Music duo Stars of the Lid and composer/pianist Dustin O'Halloran presents seven songs of withdrawn melancholy for a gorgeous journey into the elegiac. Using piano, processed guitar, string ensemble, voices and field recordings, this work recasts symphonic cinema soundtracks and classical chamber music into beautifully bleak arrangements of gentle gravity. The album A Winged Victory for the Sullen occupies a distinctive stylistic space exactly between the wash of sound on SotL's And Their Refinement of their Decline and the heartfelt, sensual journey of O'Halloran's Lumiere. Organized with understated compositional principles, the ensemble follows these methods to realize a finished piece. Besides quoting themselves, both Wiltzie and O'Halloran obviously share a respect for the film scores of Angelo Badalamenti - as in one or two places his hand seems be guiding the music. 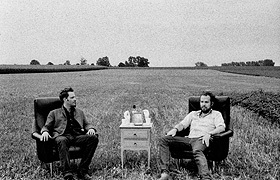 Broodingly luminous as well as accomplished and satisfying A Winged Victory for the Sullen manages to touch the mind and spirit at once - inspiring hope, even in a heart of stone.